Saint Lucy's Day or the Feast of St. Lucy (Santa Lucia, Saint Lucia or sometimes Lucia for short) is the Church feast day dedicated to St. Lucy and is observed on December 13. 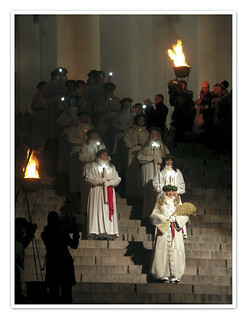 Its modern day celebration is generally associated with Sweden, but is also observed in Norway, Denmark, Latvia, Estonia, Finland (the Swedish speaking population), Malta, Italy, Bosnia, Bavaria, Croatia and Slovakia. In the United States it is celebrated in states with a large number of people of Scandinavian ancestry, often centered around church events.